There are many marketing automation platforms available, but not every enterprise marketing platform interacts with customers and prospects and then funnels and digests those interactions equally well. It is critical that you choose the proper marketing tool to meet your organization's needs. 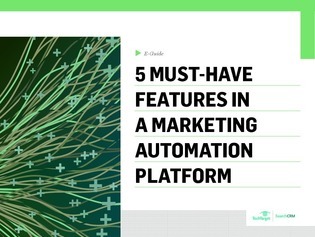 In this e-guide, uncover which 5 must-have features to look for in a marketing automation platform and find a further outline of their clusters of features. Learn about technology features that help companies craft email campaigns, automate messaging, gain insight into prospects, manage leads, cultivate a social presence and measure social activity.